Over 1,000 children took part in Renfrewshire Council’s Gateway to the Games activity week which included the seventh annual Special Games for children with physical, sensory and learning disabilities. Pupils from a total of 17 primary, secondary and special schools are took part representing: Bishopton, Castelhead High, Clippens, Corseford, Heriot, Houston, Johnston Hish, Kersland, Langcraigs, Lindwood High, Mary Russell, Mossvale, St Andrew’s Academy, St Anthony’s, St Benedict’s, St Paul’s and Trinity High. The children enjoyed some of the following: athletics, boccia (a special type of indoor bowls), bowling, curling, football, golf, hockey, karate, rugby and tennis. A range of partners have come together to make the games a success including volunteers and students from: Renfrewshire Council’s Active Schools Team, James Watt College, sports leaders from Parkmains High, Johnstone High, Glennifer High, students from the Renfrewshire School of Sport Education, St Mirren and Sports Development. All Photographs taken for Paisley on the web by Tom Chittick. A £675,000 support package is being put in place to help Renfrewshire’s 22,600 carers look after their loved ones without sacrificing their own health and happiness. Details of the new package are contained in the Renfrewshire Carers’ Strategy 2013 – 16. The document is being launched at the Renfrewshire Carers’ Centre annual general meeting on 10 June – the start of Carers’ Week. Councillor Iain McMillan, Convener of Renfrewshire Council’s Social Work, Health and Wellbeing Policy Board, said, “The work carers do is becoming more and more important as our population gets older. Carers help people live in their own homes for longer; they reduce emergency hospital admissions and they help stop people getting stuck in hospital because there is no one to look after them at home. “While people are living longer they aren’t necessarily enjoying a healthy old age. By 2035 a quarter of Renfrewshire’s population will be over 65. Many will need significant care. At the same time there will be a shrinking number of younger working people. In these circumstances our society will be even more dependent on the contribution made by carers than we are already. The Renfrewshire Carers’ Strategy 2013 – 16 is based on extensive consultations with carers. The document is designed to deliver on the issues that are most important to them – issues such as respite care, emotional support and early intervention to support carers before they reach crisis point. * Involve carers in planning and shaping the services needed for the person they care for and the support they need themselves. With Carers’ Week due to start on 10 June, carers in Renfrewshire are being reminded that Renfrewshire Council, and its partners in Reshaping Care for Older People, have set aside £200,000 to give them a chance to take a well earned break. The Free Breaks for Carers Service is free and flexible. Qualified carers step in so their everyday carer can take some stress-free time off to recharge their batteries without having to worry about the person they look after. 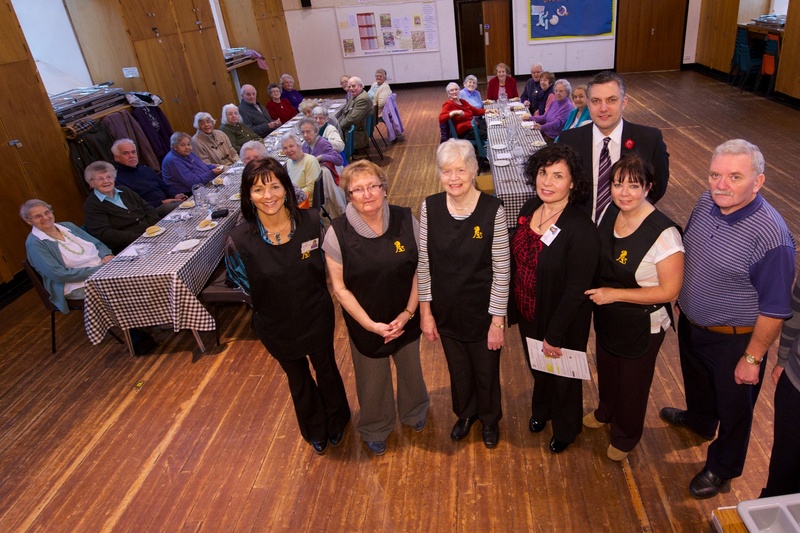 The service is open to anyone in Renfrewshire who cares for someone who is over 65 years old. The care doesn’t need to be delivered at home. The service can cater for trips and excursions if the person who is being cared for enjoys going out. It’s estimated that there are over 22,000 carers in Renfrewshire with 57% of them either looking after a parent or grandparent. Councillor Iain McMillan, Convener of Renfrewshire Council’s Social Work, Health and Wellbeing Policy Board, said, “Carers do an amazing job and our aim is to provide them with as much help and support as possible. Being a carer is a massive commitment and for many it’s more than a full time job. “The council recognises someone has to care for the carers. The help and support we provide to older people in our communities, has to extend to the people who look after them. This includes addressing the impact that being a carer has on their jobs, education, health and leisure time. “We asked carers what we could do to help and the new respite care at home service is what they came up with. It allows people to recharge their batteries and continue in their caring role. * What help they may need. More information about the service is available on 0141 207 7777 or 0300 300 1199. Respite care is also available to all carers who look after someone who is either over 16 years old, or who is a disabled child, and needs regular help with their personal and social care. There may be a charge in some cases. Hundreds of youngsters from Renfrewshire’s award-winning Street Stuff youth diversionary project took to the turf of St Mirren Park for a festival of football. Boys and girls aged from 10 to 18 from throughout Renfrewshire descended on the stadium to compete for glory during the annual end-of-season tournament. Street Stuff is a partnership between various organisations, including Renfrewshire Council and St Mirren, which provides activities for young people at various locations in Renfrewshire. The programme includes street football with coaching from St Mirren and mobile youth activities with computer games, and has helped reduce youth disorder in each of the areas where it operates. Around 300 youngsters from 53 teams took part in the five-a-side football contest, with separate sections for the 10-12, 13-15 and 16-18 age groups. Action took place on the pitch, as well as in the new indoor covered Dome behind the stadium, which was recently opened for business by St Mirren. The event was funded by Police Scotland and the Scottish Fire and Rescue Service, who are also partners in the Street Stuff initiative. Councillor Eddie Devine, Renfrewshire Council’s Street Stuff Champion was there on the night to present prizes to the winning teams. He said: “Once again, the Street Stuff football festival was well attended and proved to be a great success. “The scheme has rightly been recognised at a national level for the work it has done to reduce youth disorder by giving kids something positive to do in the evenings. St Mirren chief executive Brian Caldwell said: “We are a community club and it is important to us to be involved in schemes like this, and offer something to local youngsters. “We were delighted the end of the first-team’s season allowed us to be able to open up our doors and give so many youngsters the chance to play on the pitch and in the dome at St Mirren Park. Street Stuff is a partnership between Renfrewshire Council, St Mirren, Police Scotland, the Scottish Fire and Rescue Service, Engage Renfrewshire, McGill’s Buses and Reid Kerr College. The UK Government is changing the benefits system. In Renfrewshire many people could be affected, if you are of working age and receive benefits. There may be a need for individuals to apply for a new type of benefit or people may receive less money than before. We know this could be worrying for your clients and customers. Like us I’m sure you will feel it is important that as local service providers we all understand what could change and what we need to do to when planning services which may be influenced by these changes. Some of the changes to who the system of benefits work have already taken place but some of the most significant changes – the ones that affect local Council services – begin in April 2013. We very much appreciate you taking the time to complete this survey – thanks! Youngsters involved in Renfrewshire’s highly-regarded Street Stuff initiative are boxing clever – thanks to four new mobile youth clubs. The award-winning youth diversionary scheme offers a range of activities for young people around the area, including The Box – a moveable venue packed with computer-game equipment, and street football with coaching from St Mirren. And thanks to a recent cash boost, Street Stuff bosses have been able to up the number of Boxes from one to five. The Boxes come equipped with Xbox, Playstation and Wii computer games as well as karaoke machines. They will be stationed in areas which don’t already have similar facilities, or which have above-average rates of anti-social behaviour. Councillor Eddie Devine, Renfrewshire Council’s Street Stuff champion, met up with St Mirren player Marc McAusland at Skye Crescent in Glenburn to see the scheme in action. And Marc provided an extra treat for the youngsters by bringing along the Scottish Communities League Cup, ahead of St Mirren’s Hampden showdown with Hearts later this month. They were joined by Street Stuff staff, and representatives from Strathclyde Police and Renfrewshire wardens. Councillor Devine said: “Street Stuff really is a superb project, and deserves the praise it has been getting. “Recently, it was the subject of discussion in the Scottish Parliament, where a motion praising it received cross-party support. “There have also been calls for the Scottish Government to look into extending the programme nationwide, which is a great tribute to all involved. “I would like to thank the many people who make this programme happen – both the volunteers who give up their time to help, and staff from the various organisations behind it. 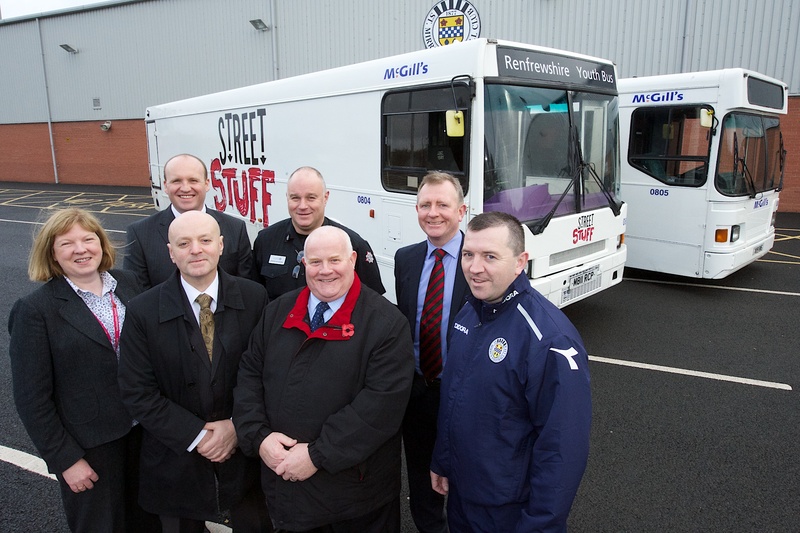 Street Stuff is a partnership between St Mirren FC, Renfrewshire Council, Strathclyde Police, Strathclyde Fire and Rescue, Engage Renfrewshire, McGills Buses and Reid Kerr College. The programme attracts up to 20,000 young people a year and – working with police and council wardens – has helped reduce youth disorder by up to 40% in areas where it operates. It also operates a Kick and Collect programme, where youngsters who take part in community clean-ups are rewarded with prizes such as tickets to sporting events. The Scottish Communities League Cup has been on a nationwide tour, visiting community initiatives and promoting the three values of the cup: respect responsibility and tolerance to football fans and families across Scotland. Two buses used to help give the young people of Renfrewshire somewhere to go in the evenings are back on the road and coming to a venue near you. The award-winning Street Stuff youth diversionary project runs a programme of activities – such as street football – at various sites in the area. Until last year, the Street Stuff timetable included a youth bus and gym bus, which went temporarily out of use when Arriva – which operated the vehicles – was taken over by McGill’s. But the two buses have since been given a makeover by McGill’s and are now back on the road. Councillor Eddie Devine, Convener of Renfrewshire Council’s Environment and Infrastructure Policy Board, met up with Ralph Roberts, managing director of McGill’s, to help show off the revamped vehicles at St Mirren Park. Councillor Devine said: “Over the last few years, Street Stuff has been doing fantastic work around Renfrewshire, with a clear trend showing a reduction in youth disorder in the areas where it operates. “While many young people will enjoy taking part in the street football, it is important we offer a range of activities which will be of interest to everyone. “The youth bus and gym bus have plenty which will help give those aged 10 to 18 something to do in the evenings and we are pleased they are back on the road. Ralph Roberts of McGill’s added: “McGill’s is delighted to support such a worthwhile initiative as the Street Stuff programme. The youth bus boasts Playstation and Xbox games consoles in its computer area, as well as musical equipment. The gym bus has six pieces of cardiovascular fitness equipment and Wii Fit computer games. As well as street football with coaching from St Mirren, the Street Stuff timetable includes The Box, a multi-functional games area. Street Stuff is a partnership between St Mirren FC, Renfrewshire Council, McGill’s, Strathclyde Police, Strathclyde Fire and Rescue, Engage Renfrewshire and Reid Kerr College. The programme attracts more than 20,000 young people a year and has led to youth disorder dropping between 18% and 40% in each area where it operates. During the summer of 2010 a ‘Taste of Africa’ event was held in Paisley Town Hall, organised by West of Scotland Regional Equality Council Ltd, working in partnership with local African volunteers and performers. From this event a few of the participating volunteers decided to get together to become a group and take forward some of the ideas and requests raised at the event. The more popular requests were for more events, family based activities, and setting up a ‘drop-in’ information shop somewhere in Paisley. To assist with the various parts of how to set up a group and go about arranging activities and so on, two volunteers, during early November 2010, the group contacted members of staff at PPRC asking to arrange a meeting with one of the development officers. Just after the first meeting of REEM and PPRC a group established to support local Polish people approached REEM and asked if they could join up with them as they found themselves facing similar situations to the Africans – for example, they struggled with issues such as learning how best to contact health service providers, how to connect with the wider community of Paisley and Renfrewshire, and how to become more aware of the cultural and social norms that are taken for granted by the indigenous population. The group and committee members have undertaken a number of consultation sessions. They have held open meetings of the committee to find out what types of things people want to do, where they would like to visit and gauge interest in holding a carnival/parade. They have held an African cultural event in Paisley town Hall, where again they asked people what they saw as the main issues for REEM to tackle. REEM are in the process of recruiting more volunteers through their own community networks and with the assistance of Engage Renfrewshire. They have also accessed local funding and been involved in CPP community based consultation events. So far the group have organised a trip for around 50 people to the Falkirk Wheel. Within the feed-back on future ideas, people were asking to visit places that make Scotland ‘Scotland’ – for example Stirling/Edinburgh Castle, Glasgow River Side Museum, Kelvingrove Park, The Burn’s visitor Centre and lots more. As money becomes available trips and days out will be organised for as many people as they can get transport for. The shop has proved extremely successful in generating quite a lot of ‘footfall’ with Africans and Eastern Europeans coming in to find out about numerous issues. The numbers coming in have surprised the committee so much that they are now looking at how to raise funding to employ people, and negotiate with various agencies and organisations for them to provide additional drop-in information sessions. The ‘Community Champions’ section is a showcase of local community groups and organisations in the town. Each group has been working in the community for years dealing with all sorts of issues. In partnership with Engage Renfrewshire, Paisley on the web will promote each of these groups via the website, social media and through our volunteer network. All of us here at Engage are committed to a strong, diverse and influential community and voluntary sector in Renfrewshire. We support local voluntary action by providing support, knowledge, and where possible innovation. We work in partnership with other support organisations and with the public and private sectors. A large element of our work involves promoting the views and needs of people involved in local groups. We like to share ideas and we’re keen to make local working relationships better.